Yup, yup, yup! Time for another "Nightstand" run down, courtesy of 5 Minutes for Books! As if I wasn't looking forward to the movie before re-reading this book - I'm now especially keen to see it. Yeah. I've never read it. 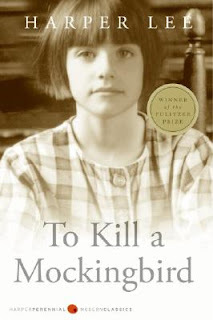 But it's on my list now and I'll be participating in the To Kill a Mockingbird reading challenge which is being hosted by Amy from Hope is in the Word during the month of August. Hop on over to Hope is in the Word to find out more about that. If you haven't read this book yet - maybe this is the month to rectify the situation! That's my plan anyway . . . Heaven to Betsy/Betsy in Spite of Herself will absolutely be read during the month of August. I'm trying to pre-read and get a head a bit in preparation for Sarah's (Library Hospital) Maud Hart Lovelace Challenge that will be up and running come October. I'm excited to FINISH reading the Betsy-Tacy books this year. Last year, during Sarah's challenge, I got about half way through. This year my goal is to finish off the series. Beyond these, I make no promises. Summer is feeling rather lazy, what with it being wedding season around here and all. I'm reading when I can, and relaxing as much as possible. I'll be as surprised as you are to see what else stumbles forth from the bookshelves to my hands in the next few weeks. Mostly the goal is to have fun. That's the most important thing, right? I didn't know you were a photographer, too - fun! 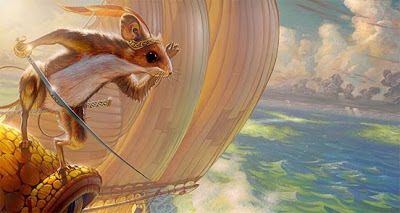 A few years back, I read the first 4 or so of the Narnia books to the girls, and Dawn Treader is the one that sticks in my memory most clearly - maybe because of the voyage motif. I enjoyed it, and will enjoy the film as well. Happy reading! 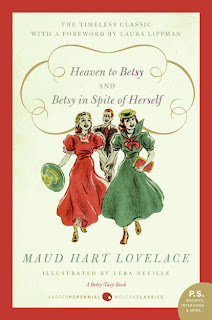 Oh I loved the Betsy-Tacy books...you'll be sad when they are done I'm sure! I'm finally making the connection that you are a photographer! Wow---your pics are great. I needed you 15 years ago! I am so excited for you about reading To Kill A Mockingbird. What fun to view it with fresh eyes. I know I've read it at least a dozen times since 9th grade English. Enjoy. I can't wait to hear what you think of it. Oh, I hope you enjoy To Kill A Mockingbird. As a teen it was one of my all-time favorite reads. And YEAH! for the Maud Hart Lovelace Challenge. I am so excited about that. I read TKAM in high school, but then several years ago our town did a "town-wide" reading of it. It was pretty cool. The library bought hundreds of books and passed them out. I liked it, but I still don't get the "it's my very favorite book ever in the whole world" fans. I'd like to hear what you say. I loved TKAM -- both the book and the Gregory Peck movie. Read it when I was much younger, but I think I'd like it equally as well now. Getting ahead, huh? Does that imply that you're caught up? Alas, that I had thought to try to get ahead before this Narnia challenge--I'll be pushing to get some posts in this week! I've read TKAM, but it's been a long time. It's on my classics list for this year, so I hope to get to it as well. I'll look forward to your thoughts. Voyage is on my list, too. I was in the process of reading the Narnia series but didn't care for A Horse and His Boy so I kind of got sidetracked but saw the trailer for Voyage last week so now I have to read it before the movie...I'm happy to see that you like it. Oh, I have got to put “The Voyage…” on my list or I’ll keep forgetting to read it! Thanks for the reminder… I first read Mockingbird only a few years ago and was so glad I finally did. You’ll enjoy it. Yes, the goal is definitely to have fun with reading in the summer. Hope you continue to! I read the Narnia books last year, I enjoyed them a lot. TKAM is a great book, gives you a lot to think about. I just read TKAM for the first time in the last year or two -- excellent book. I missed the Betsy-Tacy book but would love to go through them some time. We are reading Betsy-Tacy in our homeschool. Thanks for the link! :-) Can't wait to hear your thoughts on TKM!! I too am very anxious for the movie to come out. I love this series. I am reading The Lion, The Witch and The Wardrobe with my son at the moment. I think everyone is reading Narnia, except me. Even my kids are devouring them! I did read TLWW aloud to my kids before the first film came out and haven't been interested since. I hope you enjoy the Betsy-Tacy book. I absolutely loved these books when I was a teenager.